Cardio boxing classes provide a fun, calorie-burning alternative to monotonous activities like running. Cardio boxing uses boxing moves to provide an aerobic workout. 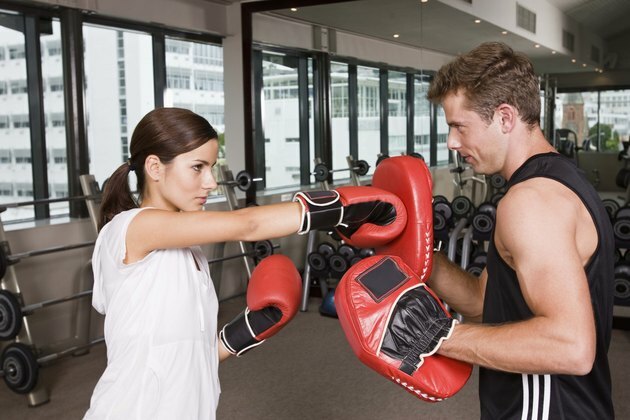 Gyms and private studios offer different types of cardio boxing classes for group exercise. You burn calories cardio boxing and running, but running gives you more control over how many calories you expend. Guides and calculators indicating calories burned are always estimates, but they give you a general idea. Cardio boxing is not the same as boxing. Cardio boxing uses boxing moves like punches, upper cuts and possibly kicks to get your heart pumping. Cardio exercise is defined as physical activity that elevates your heart rate and causes you to breathe harder, which burns calories. Cardio boxing does not teach how to box and does not involve fighting. Tae Bo classes, cardio kickboxing classes and aerobic boxing are all types of cardio boxing classes. Instructors use their own moves and unique choreography. Classes may also cater to different fitness levels. The number of calories burned in a cardio boxing class depends on the content of the class. A cardio kickboxing class -- which incorporates upper body moves with kicks -- burns around 300 to 600 calories per hour. However, a Tae Bo boxing class uses different moves so has a different calorie range. Tae Bo, or Total Awareness Excellent Body Obedience, burns between 500 and 800 calories per hour. Tae Bo is a type of aerobic class combining boxing, karate and dance created by martial artist Billy Blanks. Even within these classes, how hard you exert yourself influences the number of calories burned. General cardio boxing classes may burn as many calories as Tae Bo or kickboxing, but it depends on the intensity of the class. Your current weight is also a factor. For example, a 130-pound boxer who spars for an hour burns 531 calories, but a 205-pound boxer burns 838 calories. Sparring and shadow boxing, which is sparring without a partner, is similar to a cardio boxing class; all three activities involve constant movement and throwing strikes so they burn similar amounts of calories. Do not confuse cardio boxing with other boxing training, such as heavy bag work. Running burns a range of calories depending on your weight, your speed and your intensity. Running hills burns more calories than running a flat route. Running at 5 miles per hour burns significantly fewer calories than running at higher speeds. For example, a 130-pound person running at 5 miles per hour burns 472 calories in an hour. A 205-pound person doing the same burns 745 calories. But if a 130-pound person runs stairs for an hour, he burns 885 calories. Whether cardio boxing or running burns more calories completely depends on what exactly you do and how much you weigh.